Everyone can benefit from yoga! I can tell you firsthand that moving your body using the intelligence of yoga as your guide will lead you to feeling more at peace and alive in the body. The yoga that you practice is meant to support you. Let go of the idea of "forcing". This practice is about embracing each pose and expressing it in the way that most benefits your body. As you continue to practice, your expression of the pose transforms. Being successful at yoga is defined as "how much ease do you feel while holding a pose?" The more that we tap into the present moment and accept it for everything that it has to offer, the more we will feel the joy that is already present and overflowing. We all deserve this access to our inner resources and owe this spaciousness not only to ourselves, but to those around us and ultimately to the world we live in. It is my wish that by connecting with yoga you feel more at home in your body and more free to connect with this beautiful world. Join the Yoga With Sari Newsletter! Stay updated on classes & workshops. Receive wellness tips! Sari is an experienced yoga teacher of level I and level II Hatha Flow and Vinyasa classes. Sari currently teaches at Ebb and Flow Yoga in Vacaville, CA. In the past she has taught at Mission Cliffs Rock Climbing Gym in San Francisco, Truve in Oakland, Symmetry Yoga in Alameda, SquareOne Yoga in El Cerrito, the YMCA in San Francisco, and more. Are you looking to bring yoga to your workplace? Yoga at the workplace relieves stress and tension and encourages focus and productivity. The physical practice of yoga is excellent at addressing wrist, neck and shoulder issues that often arise with computer use. People appreciate yoga in the morning as a way to foster a more mindful day, in the afternoon as a mid-day refresh or in the evening to unwind. For more information on how to bring yoga into your workplace, contact Sari. Youth need yoga, too! Sari is a Yoga and Mindfulness teacher to teens. She has developed curriculum and taught at high schools such as Lighthouse Community Charter School in Oakland. And she has taught yoga during the summer at UC Berkeley for the internationally attended summer camp, Summerfuel . She got her grounding in teaching youth from learning and teaching with the amazing Bay Area nonprofit RISE Yoga for Youth. While teens is a special age group to offer yoga to, Sari also teaches students as young as 6 years old at workshops and summer camp programs. Contact Sari to inquire about bringing yoga to your school or summer camp! Sari offers one-on-one Private Lessons, Group-Building Experiences, Partner Yoga sessions and Family Yoga. Click here to learn more! Contact Sari to schedule an experience that is tailored just for you! 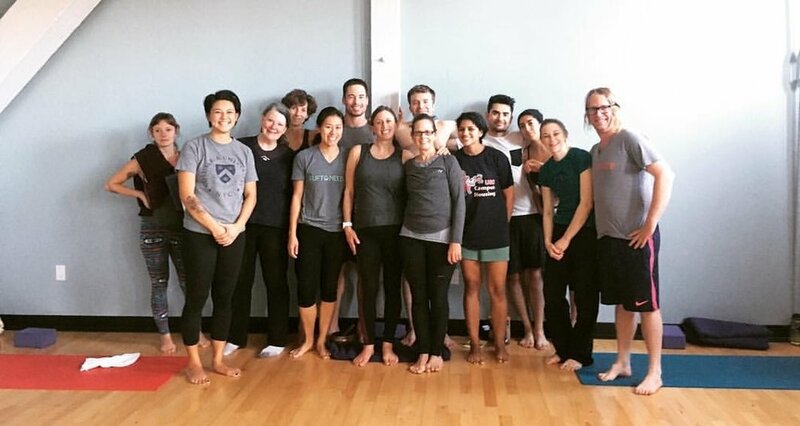 Sari Gelzer Stankowski, RYT-500 is a Sri Yoga certified yoga teacher in Vacaville, CA and the San Francisco Bay Area who creates experiences that tap into the physical and energetic bodies. Sari offers hatha flow and vinyasa style yoga classes and workshops in studios, workplaces and High Schools. With experience as an athlete and massage therapist, she uses her knowledge of the body to provide her students a practice that builds physical strength, mental clarity and overall vibrancy. She combines breathwork (pranayama), meditation and movement (asana) to assist students in being their most vibrant self. Sari has been practicing yoga since 2001 and has explored a wide range of styles during that time. Her continued practice led her to study Sri Yoga with Brenna Geehan and Jean Mazzei. She enjoys working with a wide range of ages and is a certified yoga for youth instructor.